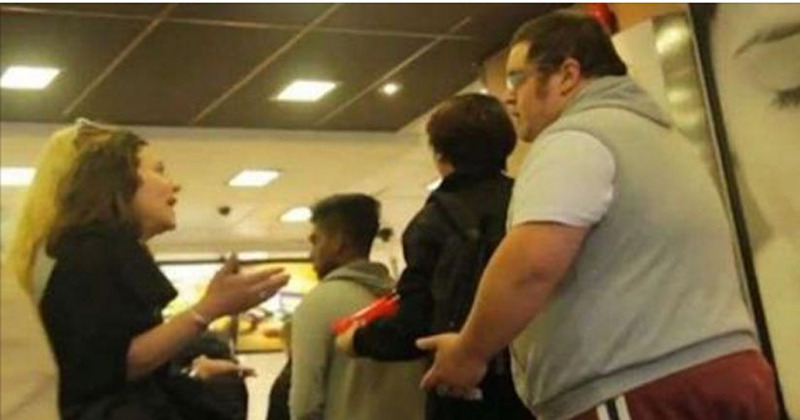 A video has gone viral which involves a man being brutally fat-shamed by two young women in a McDonald’s. The women call him things like “disgusting” while saying how fat people shouldn’t even be at places like McDonald’s. Meanwhile, two men in line are totally shocked by what is going on. The women are relentless. “Stop eating” they say to the man while telling him to jog out of the restaurant. The woman bully then tells the man to order a salad. Then the guy actually pours his drink all over the woman’s head! The customers cheer the action on! Many positive comments have been received for the man standing up to the bully and dousing her with a beverage. Some thought that it was unnecessary though, but many believed it to be very right on and justified. Then there has been the question on whether this whole thing was a performance of some sort. The reactions seemed pretty staged and the acting not too realistic as some people pointed out how she didn’t seem to surprised when the drink was poured over her head. Turns out, those who thought it was a set-up, were right. The whole thing indeed was a performance prank, labeled as a social experiment. It indeed did get people talking and likely made many wonder what they would do if they witnessed such an event! In any case this would be a bizarre thing to witness while standing in line at a McDonald’s. Share this strange social experiment with friends and family!